The Sam Fox School’s new MFA in Illustration & Visual Culture program explores the idea of illustration authorship by combining studio practice in illustration with curatorial training in visual and material culture. This program is ideal for illustrators, designers, and those interested in working with popular visual matter of the modern period: how it was made and by whom, who it was for, and how it remains relevant today. This is a two-year residential program, launching in fall 2019. Graduates of the program will be prepared to work as author-artists of graphic novels and picture books, professors of illustration, critical writers on popular culture, and curatorial staff in museums, libraries, and auction houses. The MFA-IVC program is built on the strengths and expertise of the School’s illustration and design faculty, and the vast visual culture resources of Washington University, including the D.B. Dowd Modern Graphic History Library, a preeminent site for studying the history and culture of American illustration. Click on the links below to view these videos on the Sam Fox Vimeo page. In this short clip, program chair John Hendrix addresses the difference between the new MFA in Illustration & Visual Culture and the MFA in Visual Arts programs at Washington University. Portfolio Advice! Program chair John Hendrix talks about preparing your portfolio for the MFA in Illustration & Visual Culture program at Washington University. Writing Sample Advice! Program chair John Hendrix talks about preparing your writing sample for the MFA in Illustration & Visual Culture program at Washington University. As part of a larger transformation project for the east end of Washington University's Danforth Campus, the Sam Fox School is investing in the construction of Anabeth and John Weil Hall to significantly enhance resources for our programs in art, architecture, and design. Construction on the 82,000-square-foot facility, designed by KieranTimberlake, began in May 2017 with an anticipated opening in fall 2019. The building includes the 2,600-square-foot Roxanne H. Frank Design Studio, which will offer a flexible and open space to accommodate 30-50 students, pinup and critique areas, a printing hub, and central AV. 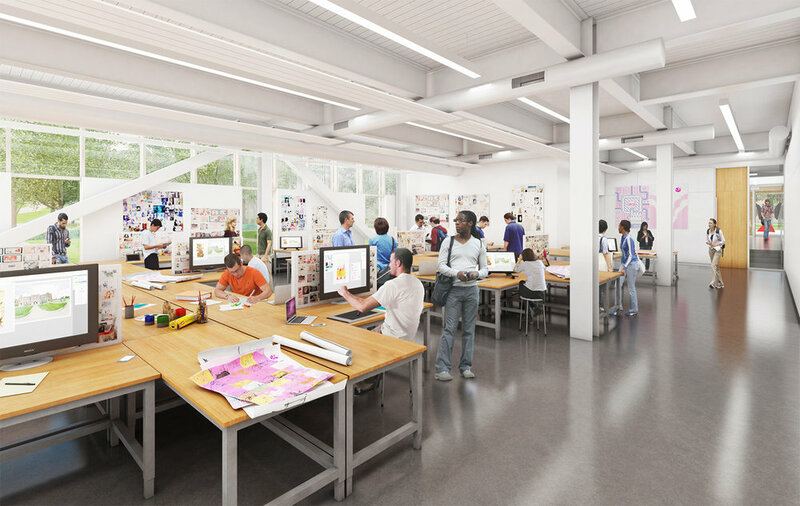 Design students across the Sam Fox School will have access to new resources in Weil Hall such as a state-of-the-art digital fabrication lab, exhibition and project spaces, a two-story indoor court, and a future experimental studio for video, film, and time-based media. Weil Hall will offer ready connections to the rest of the Sam Fox School facilities and buildings, including the Mildred Lane Kemper Art Museum, as well as to new campus resources such as a dining pavilion and alternative transportation commuter hub. MFA Illustration & Visual Culture studios and primary classrooms, featured above, are designed on the ground floor of this new building. The Nancy Spirtas Kranzberg Studio for the Illustrated Book is a working book and print production facility that includes equipment for letterpress and intaglio printing, photopolymer plate, and silkscreen printing. The Book Studio promotes the study of fine bookmaking and is a collaboration between Washington University Libraries and the Sam Fox School's College of Art. Currently located in Walker Hall, the Book Studio will soon be moving next to the printmaking studio in Bixby Hall, allowing MFA-IVC students to explore significant connections between the disciplines of printmaking and book arts through individual coursework and means of thesis production. Students in the MFA in Illustration and Visual Culture program will be considered for scholarship/remission awards ranging from 12% to 100%* of total tuition. U.S. citizens and permanent residents will also be eligible for loan support, dependent on financial circumstances and merit. For complete information about aid, please visit our financial aid page. The Sam Fox School website lists all of our graduate tuition costs and fees. *Total scholarship values listed are subject to minor change. The Sam Fox School of Design & Visual Arts offers rigorous degree programs in design, art, and architecture; an outstanding collection of a world-class art museum, and the unparalleled resources of a leading research university. With a nationally recognized faculty, innovation and collaboration are at the core of our mission. We recognize that design and the visual arts play significant roles in shaping social, environmental, political, and technological conditions. Our School is flexible, attuned to the realities of our complex and global century. The College of Art was founded in 1879 as the first professional, university-affiliated art school in the United States, and is the only art school to have fathered a major metropolitan art museum. The College of Architecture was established in 1910, and has the distinction of being one of the 10 founding members of the Association of Collegiate Schools of Architecture. The Mildred Lane Kemper Art Museum (formerly the Washington University Gallery of Art) was founded in 1881 as the first art museum west of the Mississippi River. Washington University in St. Louis’ mission is to discover and disseminate knowledge, and protect the freedom of inquiry through research, teaching, and learning.